Bed bugs seem to be one of the most hated and feared kind of blood-feeding insect, even though they have not, as of yet, been shown to transmit any kind of disease. Interestingly enough, we tend to write off other insects that feed on our blood, like mosquitoes or ticks, as just nuisances even though they have been proven to pass disease onto humans. The real reason why people run to the phone to contact their bed bug exterminator in Seattle may not be because of physical danger or discomfort, it is most commonly because of the emotional damage that bed bugs can cause. No other kind of insect causes emotional distress quite like a bed bug does. People that suspect that they have bed bugs tend to become obsessive about them. They will stay up all night scouring the internet for information or searching every nook and cranny of their home. Some people become so involved with the idea that they might have bed bugs that they may even miss work. The cause for this level of emotional distress may be due to the fact that bed bugs don’t just bite you and leave you alone, they invade our lives and our most personal spaces: our homes, our furniture, and our beds. If you feel that you have a bed bug issue in your home, don’t let the emotional distress get to you. Instead, turn to Northwest K9 Bed Bug Detectives. 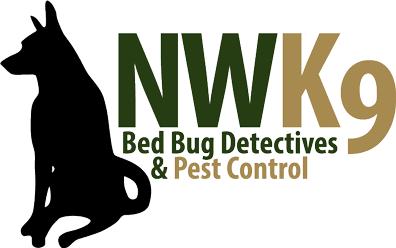 We can give you the reliable bed bug treatment that you have been looking for, so that you can have the peace of mind in knowing that those bed bugs are taken care of.